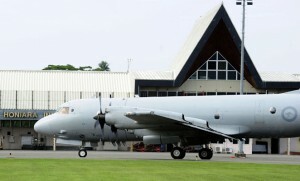 An RAAF AP-3C Orion has taken part in annual operations targeting illegal fishing in the South Pacific. An RAAF AP-3C Orion maritime surveillance aircraft has deployed to support a multi-national operation targeting illegal tuna fishing in the South Pacific. Operation KURU KURU, which ran from November 7 to 14, patrolled a 30-million square kilometre area as part of annual efforts to keep poachers out of the lucrative Pacific Tuna fisheries. The Orion flew four missions as part of the operation, identifying about 100 fishing vessels within its areas of operation, the RAAF said.